Her orders to burn the dead Darkspawn, strike camp and prepare for a dawn departure were sharp and left no room for question as she turned and walked off into the darkness. Even Morrigan held her tongue and got busy after only a moment’s rebellious hesitation. Alistair moved uncertainly to help Sten and Ogden with the ghastly task of disposing of the bodies, but Zevran caught him by the arm and shook his head. “She is in need of comfort, I think. If you do not go to her, someone else might have to. I do not think you would appreciate if it were me, am I right?” Zevran grinned coyly, but it did not mask the seriousness in the elf’s eyes. “Yes. Right. Me. Me? Really? I’m sure the last thing she needs is a babbling idiot to comfort her.” Alistair replied, twisting his hands. “Silence, and an arm to lean on works well,” advised Wynne. Wynne only smiled and shook her head. Alistair found Mardelle at the edge of the clearing, kneeling with Tamlen’s head on her lap. She didn’t seem to notice his approach and he almost lost his nerve, but when he sat beside her, she began to speak immediately, and he made a note to thank Zevran and Wynne for their advice. 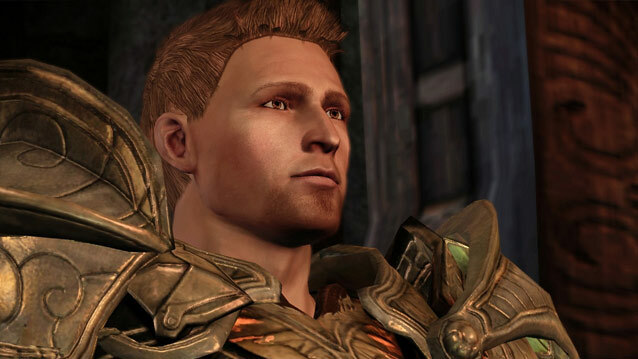 Alistair bristled defensively and pulled away, meeting her piercing gaze and trying to understand just where this conversation was going. “Something changed though... right?” he ventured hesitantly. “Ostagar opened my eyes to the words of my father. Not all humans are to be feared and hated. When there is a greater purpose, we all must work together. As if Ostagar and all we have been through already has not served as enough proof that there is something far greater at work here, Tamlen...” she fell silent for a long time, caressing his face. It was hideous with the corruption, but peaceful. She sighed and nodded, allowing him to help her to her feet. He picked up Tamlen’s body, doing his best to ignore the stench as they made their way to the pyre that used to be Morrigan’s camp site. He looked to Mardelle and, at her nod, tossed the body into the flames as reverently as he could manage. Leliana approached then, taking Mardelle’s hand. The bard looked to Mardelle for approval and began to sing the Dalish funeral lament. Attracted by the haunting song, the others gathered slowly, staring into the flames in respectful, contemplative silence. A tear slipped down Mardelle’s cheek when Leliana’s melody came to an end. She wiped it away and raised her head to address them. “We are the Grey Wardens. The last in Ferelden. Though we are few, our responsibility remains: We must stop this Blight. That is what we do. For Ferelden. For all. Even at the cost of our own freedom. Our own lives. Mardelle had been speaking into the flames, but she turned now to face him, placing a hand on his chest. It had been several months since she had made that speech and then made it reality. Alistair would have liked to believed that he had some part in that – he did defeat Logain, afterall – but he was fooling no one. He was king now because of her and Arl Eamon, whether he liked it or not. But he knew they were right. This wasn’t about what he wanted. His life had never been about him making his own choices, so why should this have been any different? He belonged to the Chantry. To the Grey Wardens. And now he belonged to the people. As always, he had a duty to fulfill. And his first duty as king was to let go of the one thing he needed most. “Forgive you?" he asked incredulously clearing the distance between them in a few strides, "Maker's breath! I .. I owe you everything!" He sighed heavily and sat down beside her, enfolding her small hands in his. “There is no need to apologize. You understood long ago that we were never meant to be. And loved me anyway." "I am fairly certain that I will always love you, in spite of all of this.” She rested her head on his shoulder and they sat in silence for some time. As comforting as the affirmations of their love were, there was still a great weight hanging over them. Their fates still hinged on the death of the archdemon, which in turn meant the death of one or both of them, rendering all their future plans moot.